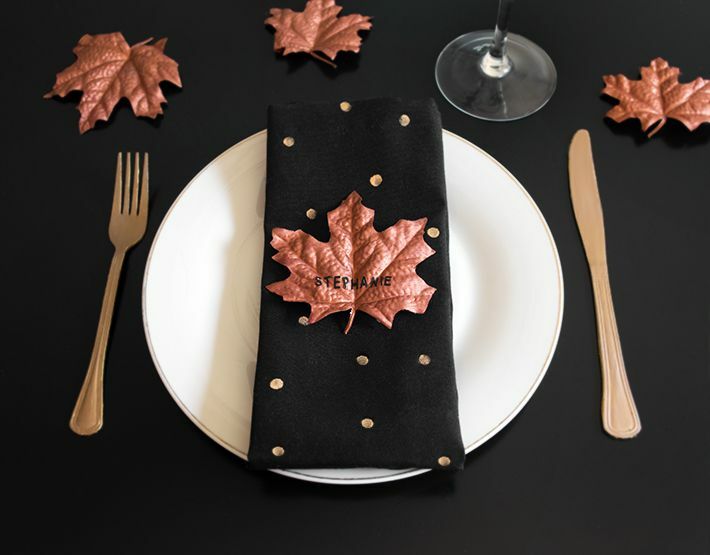 Set the table this fall, for a seasonal dinner party or for Thanksgiving, with these gorgeous fall leaf place cards. These are very easy to make and they're reusable, so you can bring them out every season. To begin, cut the leaves off the branches using wire cutters. When cutting the leaves off, cut close to the base of the leaf so to not leave much of the stem. Lay all the leaves flat and paint the tops of the leaves with a coat of copper metallic craft paint, using a foam paint brush. Allow the paint to fully dry before painting the second coat of paint. Depending on the paint and the original color of the leaves, it might be necessary to paint more than 2 coats of paint per side until the leaf has an even paint finish. Once the second coat of paint has dried, flip over the leaves and paint the backside of the leaves, again with 2 coats of paint, allowing the paint to dry between coats. On the front side of the leaves, write the name of the each person attending the party. You can either write the name using a black Sharpie marker in the middle of the leaf or use small letter stickers to spell out the name if you prefer. In the example, small black stickers were used, which you can purchase from the scrapbook section of a craft store. Place one leaf in the center of each plate on the table to indicate where each guest should sit. If there are extra painted leaves without names, they can be used to decorate the table in the middle between serving dishes. After the dinner party, the letter stickers can be pulled off, or the names in Sharpie can be painted over with a fresh coat of paint and the place cards can be reused for another party.